Now that most of the well-known horror films of the 70s and 80s have been rebooted, remade and remixed, I think it's safe to say we can look forward to lesser known American drive-in fare getting a similar treatment. Here, American Horror Story Producer Alfonso Gomez-Rejon has teamed with the long dormant Orion Pictures and Jason Blum to update Charles B. 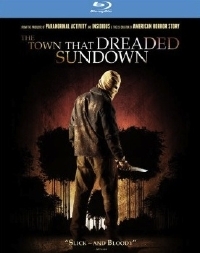 Pierce's well regarded 1976 film The Town that Dreaded Sundown for a whole new audience of horror fans. While the results are a mixed bag in terms of the film's scare factor, the film is a stylish and clever enough re-imagining of the original that I found it a compelling watch. This new version of The Town that Dreaded Sundown plays early homage to the original by kicking off the proceedings at a local Texarkana drive-in threatre where a retrospective screening of Pierce's '76 film is happening. Of course, in the world of the movie, the film being shown is based on a series of murders that occurred in the town 65 years earlier. This is an example of how the film at least attempts to offer a different approach to the whole remake process. This signals the beginning of a new round of slayings in the town that centre around teenager Jami (Addison Timlin), who takes it upon herself to solve the case. Since The Town that Dreaded Sundown is firmly in the slasher vein, the film does fall victim to some cliches of the genre. Character are written broadly and some unnecessary sexual degradation serve only to create visceral reactions that don't always land. Overlooking some of the film's more tropey leanings however, TTTDS is lavish production full of eerie atmosphere, brutal killings, some good performances and a core mystery that's actually got a decent reveal to it. While the Blu-ray has a wonderful 1080p transfer that highlights the work of cinematographer Michael Goi, it doesn't have much by way of special features. This is too bad, because I would have loved to get the story behind why the filmmakers thought TTTDS was ripe for a remake. But those last 10-15 minutes are godawful and nearly ruin everything that comes before them.